Damage/Repair Surface scratches, embedded dirt, and handle creased. Additional Information: A beautiful headrest probably made by the Turkana. 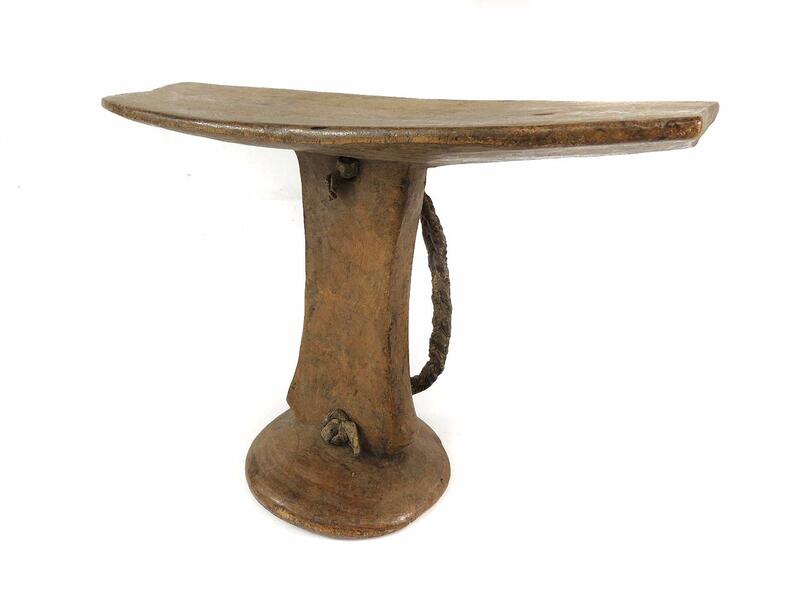 The gorgeous light patina is typical of the Turkana headrest. The Turkana live in the Turkana district of Rift Valley, in Kenya. Their exact number is not known. Estimates run from the old figure of 250, 000 down to 340,000. They are Kenya’s third-largest ethnic group of pastoralists. Like their neighbors the Maasai, cattle are their primary wealth. They always move from place to place in the search of good pasturage, water and fresh vegetation for the cattle. Many Turkana families are now engaged in agriculture and fishing. While there are a quite few art-producing peoples of Kenyan origin who have contributed significantly to the recognition of East African art, the Turkana, along with their closely related neighbors the Maasai, are arguably among the most important of them all. 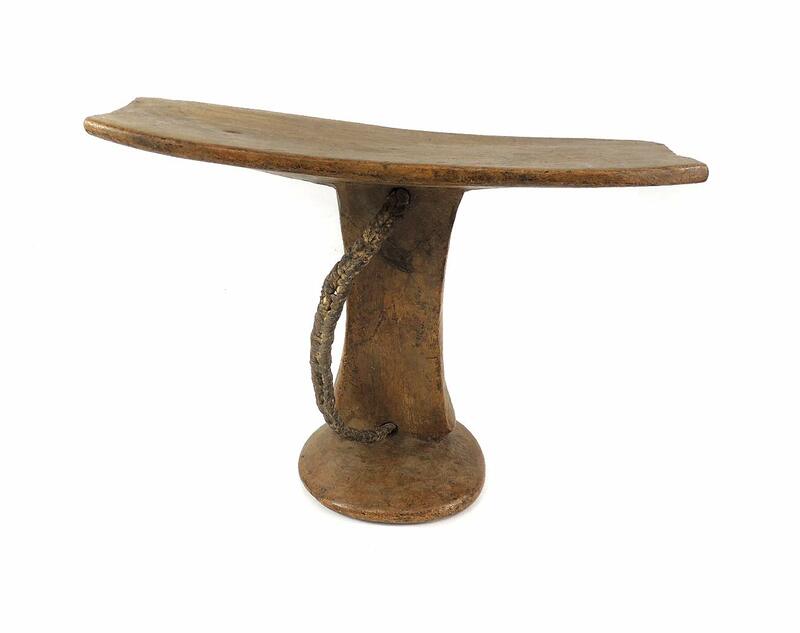 In fact, much of the art from the Turkana region is composed of a wide variety of everyday objects out of wood, leather and gourd, but in their hands many of these utilitarian pieces have risen to levels of beauty unparalleled in East Africa. The simple, reflective appeal of this unusually headrest is a fine example, and the patina and wear demonstrate its importance to the owner. The vital role of headrests or stools is obvious among the Turkana. That’s why these objects are carefully carved and carried everywhere individuals go. The leather cord attached to the headrest helps to carry it easily. Headrests are used as pillow. They also help to protect sophisticated coiffure. As a personal object, the headrest has become part of the individual. Usually, when the person died, he is buried with his headrest. Sometimes the headrest is passed on to his heir, who would treat it with respect because this wooden piece embodies the spirit of the deceased person. 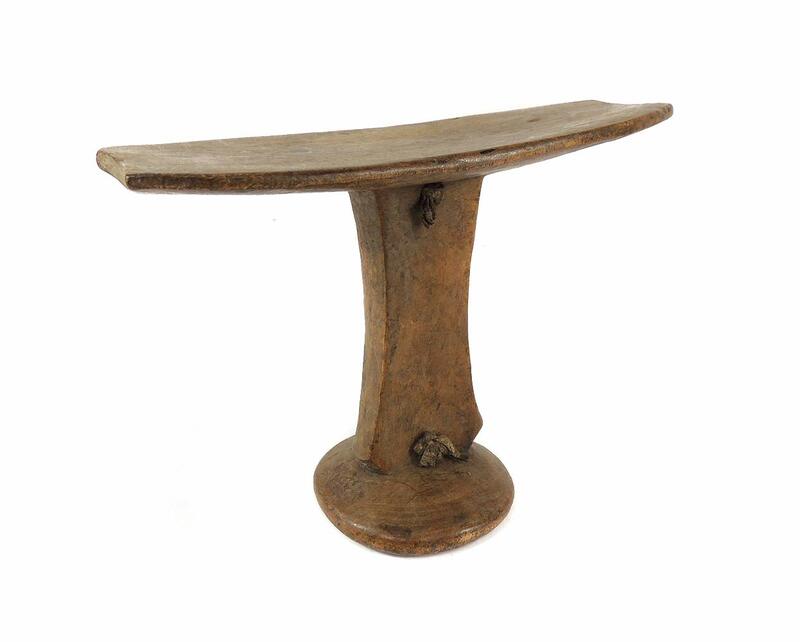 Turkana headrests or stools range from the simple to elaborately carved artifact. Their styles are similar to these found among the other nomadic pastoralists of Uganda, Sudan and Ethiopia, particularly among the Karamajong, and Pokot. All these peoples share cultural traits with the Turkana. Recommended Reading:, see SLEEPING BEAUTIES-THE JEROME JOSS COLLECTION OF HEADRESTS AT UCLA, by Dewey. Gunter Best, Marakwet & Turkana. New Perspectives on the Material Culture of East Afrian Societies, Museum fur Volkerkunde, Frankfurt, 1993.